I was preparing Stan Trzoniec's review of the STI Eagle prior to posting it on the website when I realized what was missing in my life. It's not riches or fame; I'm in the wrong line of work for that. No, what I'm really missing is a .38 Super. When I was a kid my dad turned me on to Mickey Spillane's tough guy hero, Mike Hammer, and by extension the Model 1911 pistol. While I was many years away from being old enough to buy a 1911, that didn't stop me from poring over the Shooter's Bible that lived on the nightstand next to my bed. The choices for manufacturer back then were pretty much Colt, Colt and Colt, and I agonized over whether I should get a basic Government model, a Commander or maybe a Gold Cup Match. 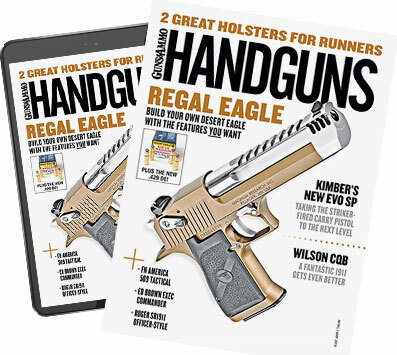 Mike Hammer, of course, shot a .45 ACP, but in my feverish study of ballistics of cartridges available for the 1911 I took one look at the .38 Super and thought, "This is it! Why wouldn't everyone shoot this?" It was fast and offered lots of energy, relatively speaking (Winchester's 125-grain Silvertip load spits out of the barrel at 1,240 fps for 427 ft.-lbs. of energy). Also attractive to a kid: It has the word "Super" in it. A no-brainer. Nowadays I know maybe a little bit more about guns than I did then and understand all the reasons why the .45 and 9mm are popular in the 1911 and other autos while the .38 Super is not. But guess who loves the .38 Super? Speed/action shooting enthusiasts. They love it because the bullet gets out of the barrel and to the target quicker and because the low recoil lets them transition to the next target faster. I've had only one opportunity to shoot a Super over the years, a Para 1911 with a shiny chrome finish and faux ivory grips (a style said to be popular with shooters south of the border, in countries where owning guns chambered to military cartridges such as the .45 and 9mm isn't permitted). I tested it and loved shooting it but wasn't taken with the look, so I sent it back when I was finished. Do I need a .38 Super? No. Do I still want one? Oh, yes. Will I be able to justify the purchase to my wife? Dicey. But the choice fits with my predilection for "oddball" calibers, and it will be fun shopping for one. My choices here in California boil down to Smith, Para, Taurus, Springfield, Kimber and Armscor.